Today I welcome author Elle Newmark to the blog. As part of her Pump Up Your Book tour, I got a chance to review her latest, The Book Of Unholy Mischief, which will be on the blog tomorrow. I also got a chance to ask her a few questions. Here’s what Elle had to say. Diva: Describe Elle Newmark in five words. Elle: Student of the human condition. Diva: What are three things we'd be surprised to learn about you? Elle: I own 25 pairs of pajamas because I work in them. I shower in the morning and put on pajamas that I wouldn't mind answering the door in. At night, I take another quick shower and grab a fresh pair. Even though I wear pajamas most of the time, I'm a clothes horse. I have clothes I haven't worn yet. I do all my shopping (including groceries) online. Diva: What was the first book that you read that made you fall in love with reading? Elle: Mara Girl of the Nile. I lived in a Chicago apartment and I loved being transported to Egypt and becoming immersed in Mara's exotic adventures. Next came a set of children's classics including Robin Hood, Treasure Island, The Arabian Nights, etc. Those were so vivid to me that I illustrated them in a notebook. I don't remember a time when I didn't love to read. I'm just a born bookworm. Diva: What's on your TBR (To Be Read) pile right now? Diva: What authors would you say had the most influence on your decision to become a writer? Elle: First John Steinbeck and then John Updike. Steinbeck's work moved me so profoundly that I remember marveling at the fact that simple ink on paper could wrench my soul and change my worldview. That's when I really understood the power of the written word. I later admired John Updike for his masterful way with words and metaphors. There were many terrific writers in the twentieth century but John and John struck the spark that made me write. Diva: Describe your road to publication? Elle: Long and rocky. I wrote for more than 25 years before I self-published because I was sick of being rejected by traditional publishers. But I did an Internet promotion that caught the eye of an agent at William Morris (now William Morris Endeavor). She asked to read the book and I gladly overnighted it to her. I signed with William Morris within 48 hours of my promotion, and two weeks later my book went to auction and sold to Simon and Schuster. After a quarter of a century of banging on that door, it flew open and pulled me inside in a New York minute. It's not a typical publishing story and I'm still not quite sure how it all came about. Diva: What advice would you give to aspiring authors about getting their work published? Elle: Don't get discouraged and don't quit. Okay, you might not be able to avoid some discouragement, but don't quit. It's a very tough business and breaking into it is the first and one of the hardest parts. Always remember that if you love to write you're already one of the lucky ones because you have a passion for something that enriches your life. Publishing is nice but not the nirvana many unpublished writers think it is. Writing is still the best part. Diva: Are you working on anything new? What else can we expect from you? Elle: My new book, THE SANDALWOOD TREE, will be out April 5, 2011. Two unconventional love stories, ninety years apart, set against the backdrop of war-torn India. One story takes place in 1947, the fateful year of India's partition between Hindus and Muslims, and it involves an American couple and their young son, living in a colonial bungalow. The second story, slowly revealed through old letters and journals discovered by the American character, describes the life and loves of two young Englishwomen who lived in the same bungalow in 1857, the year of India's First War of Independence. Right after finishing this book in the fall of 2009 I became seriously ill. I spent a total of two and a half months in the hospital, on and off ventilators and in and out of comas. More than once, my family was told to brace for the worst. Meanwhile, my editor had read the book and sent back her notes for a final draft, but I couldn't even sit up, much less work. My agent, editor, and publisher believed in the book and were all very gracious and patient. Ironically, the epigraph in this book is "...death steals everything but our stories," and that helped me. I decided that The Sandalwood Tree would be part of my story. When it looked like I was out of the woods, my daughter brought the notes to the hospital and helped me get through them. I whispered and she typed. I could only work for an hour at a time, but we did it every day until it was done. The Sandalwood Tree was delivered from my hospital bed. I did a tremendous amount of research for this book. I drove around Northern India for a month, taking notes and interviewing people, including a colonel in the Indian army who served under the British and lived through partition. I spent many months reading about Indian history, and many hours lying on various hotel beds in a fetal position, trying to digest some local "delicacy." But it was worth every minute. I've never seen such a rich, layered, complex, colorful, tragic and joyful culture. Writing The Sandalwood Tree was an adventure. 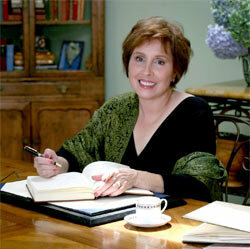 Elle Newmark is an award winning writer whose books are inspired by her travels. She prowled the back streets of Venice to cook up The Book of Unholy Mischief and explored India by car and elephant to conjure The Devil’s Wind. She calls California home. Please stop by the blog tomorrow to read my review of The Book Of Unholy Mischief.